Tell me about Your Child care Business? I am a Nebraska Home Daycare 2, this means I am licensed for up to 12 children, with the requirement of a secondary provider. Originally I served a small group of three to five children at a time, but as my demand grew, so did my need for a bigger license. My (future) husband and I have been running our home daycare for a long time now; the kids refer to him as the “Field Trip Dude,” because he will take the school-agers on their outings, while I stay behind with the younger children. I have my Licensed Practical Nurse (LPN) degree, but did not find it fulfilling at all, I could not imagine doing anything else with my life. We are endorsed through Eco Healthy Childcare, participate in Scholastic Book Clubs, Book It Until Bedtime, Omaha Childcare Share Resource & Support Group, I am certified in SIDS/Shaken Baby Prevention, as well as Child Abuse And Neglect Awareness certified. I have been working in childcare for fifteen years now, many of my original daycare boys and girls have graduated high school, I am waiting for the day that they bring me their children for childcare, and then I will feel very old. I am a curriculum writer and designer, I offer lesson plans and ideas to a few local childcares’ in my area. My ultimate goal is to open my own daycare center, but that will be a project when my own children are older. I have my associates’ degree in Early Childhood Education and am currently in college full-time to work on my bachelor’s in Early Childhood Education with a minor in special needs and development. My program started off very small, with just a hand full of families, now I often have waiting lists for my programs, such as my “Summer Fun” program that extend a year or more in advance. I grew up knowing this is what I wanted to do, I always knew I wanted a houseful of children; I loved the idea of getting to play and discover each day, to be able to be a child’s first step toward kindergarten and beyond. I would pretend to have a daycare with my stuffed animals and started babysitting before I could even have a learner’s permit. I could not imagine waking up in the morning and not having the faces of many children coming to greet me each day. I hope that I will be able to keep doing childcare even into my advanced years and beyond. With enough caffeine, I can run circles around any two- year old! 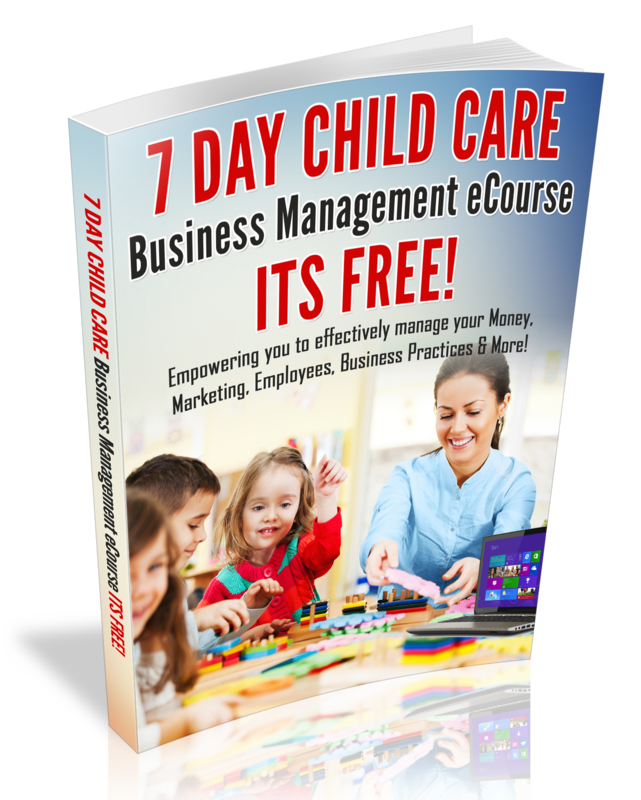 What do you think is the key to a successful child care business? Find what makes your daycare so special, and lock into this. Competition can be stiff, the lady down the street may charge less than you do, a new center may be opening up a few blocks away. It is so important to discover what makes you stand above the rest. For me, Lyons Den concentrates on the three F’s: Friends, Fun and Field Trips. During the summer months, we take daily field trips, during my September-May preschool program, we offer “Field Trip Friday,” we tie together our weekly theme (unit) into a place or activity in our community, such as the dentist office, a pizza restaurant, even behind the scenes of zoo exhibits and movie theaters. Children learn the best hands on, offer them that opportunity. Organization. Plan your meals and crafts a week in advance, lay necessary materials out the night before. Always have a plan b, it is better to plan too much into your day, than not enough. When children have too much freedom, chaos happens very quickly. Offer enough in your home for each child to play both independently or in a group setting. Have centers for sensory, literacy, large motor and fine motor skills, house, building and such. Make sure your centers have defined boarders; label your shelves with a picture of the toy to ease clean-up. Allow children to take toys from one center to another, you will be amazed where their creativity takes them! Most importantly, when setting up your childcare area, allow plenty of room for children to move about, but do not have excess room for them to tumble and rough house. Parent communication should always be a priority, offer your parents a weekly newsletter, post a large bulletin board where parents will see it each day, have a website for your childcare, use social networking, such as Facebook, make a page for your business, post lots of pictures, reminders and special notes. Please remember to adjust your privacy settings, your pictures and important information should only be viewed from your childcare families and any other people, which they choose. Lastly, hold only the highest standards for yourself, you are a professional, you are not a babysitter that title is taken by the 14-year-old girl, who watches the neighborhood kids. You are a business woman. Set short-term and long-term goals, where do you see your program in 6 months a year, two years? What advancements would you like to make a reality? Be the best at what you do and a professional each day. My biggest piece of advice for a newcomer would be to set boundaries before you open your doors. This is your home, set your hours based around your family, set your tuition on what you deserve to be paid. Parents are willing to pay for quality childcare. It is so exciting, in the beginning, when that phone rings, and someone is interesting in your childcare, you want to jump up and down and cannot wait for them to start. But, remember that no all families who express an interest in your childcare program will be a good fit for you and your family. I always conclude my interviews by saying, “I appreciate your interest in my daycare, I am going to review our interview and see if we are a good match for each other. I will let you know in a few days, one way or another.” It is okay to turn a family down, there will be more interviews in the future, I promise. You need to have a contract, there are many templates and examples on the web, take notes from what you read and learn from these websites. A good contract will cover closures, needed supplies, tuition rates, parent’s unpaid days, extra fees and more. Great partnerships are based on an understanding of responsibilities and goals right from the start. Also, contact your current insurance company and obtain the proper insurance policy for your childcare. You should go to bed each night, excited for a new daycare day! Visit my website at www.lyonsdendaycare.com or contact me at info@lyonsdendaycare.com I would love to share to advice, tips and techniques with you. The salary of a daycare center owner depends on how much money the center makes a year.